Buy with confidence from people who know what they sell. Memberships include in part, Association of Naval Aviation, The Tailhook Association, Silver Wings, and McCampbell's Aces Squadron. PRICE $ 475.00 PLUS $25.00 SHIPPING AND HANDLING which includes stand TO 48 contiguous STATES. 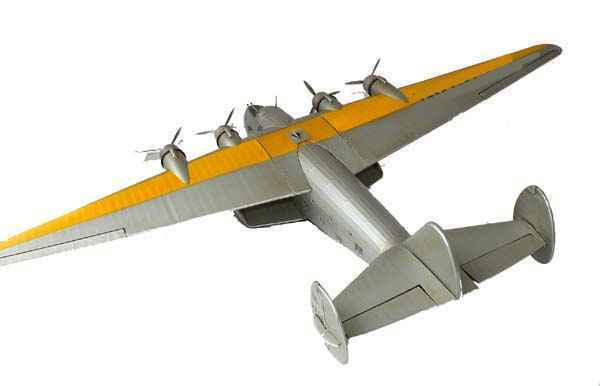 For collectors and model airplane buff's, or those seeking an incredibly impressive gift, here is a model so unique you don't want to miss out. This replica is of the most famous of the twelve Boeing Model 314 Clippers, the Dixie Clipper, America's first presidential airplane. It is built to a level of excellence unparalleled in production model making. No one, even custom professional model makers, can achieve this level of accuracy at anywhere near this price, and comes complete with a custom desktop stand. Our Boeing Dixie Clipper is designed and built in the same fashion as the real planes using frame and rib construction. The attention to detail is outstanding with working control surfaces, i.e. ailerons, rudder and elevator is designed and built in the same fashion as the real planes using frame and rib construction. The frames and ribs are wood, and are covered in silk which is then painted. The engine's propellers spin. The nacelles are of made of spun aluminum, and the doors and hatches use aluminum sheet, The cockpit and all portholes are accurately replicated. Everything is authentic to the period, and includes historically correct markings and colors. DIMENSIONS are 32" wingspan, 22 1/2" long, 6" high. 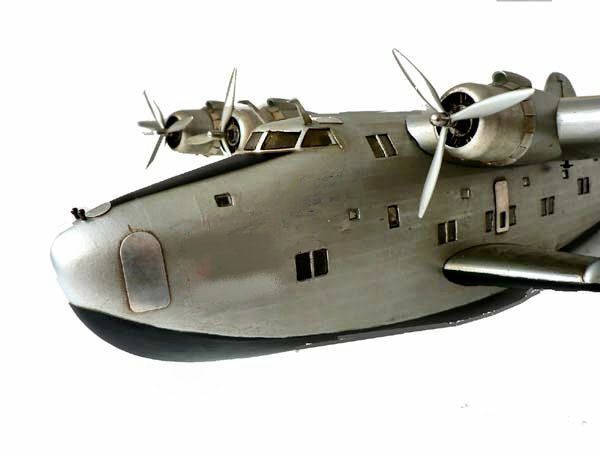 HISTORY: As airplane travel became popular during the mid-1930s, passengers wanted to fly across the ocean, so Pan American Airlines asked for a long-range, four-engine flying boat. In response, Boeing developed the Model 314, nicknamed the "Clipper" after the great oceangoing sailing ships. 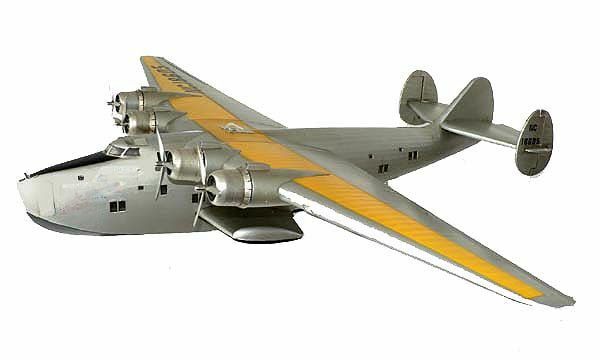 It used the wings and engine nacelles of the giant Boeing XB-15 bomber. New Wright 1,500 horsepower Double Cyclone engines eliminated the lack of power that handicapped the XB-15. With a nose that later saw rebirth in the design of the modern 747, the Clipper was the "jumbo" airplane of its time. Boeing built 12 Model 314s between 1938 and 1941. At the outbreak of World War II, the Clipper was drafted into service to ferry materials and personnel. Few other aircraft of the day could meet the wartime distance and load requirements. The Model 314 had a 3,500-mile range and made the first scheduled trans-Atlantic flight June 28, 1939. By the year’s end, Clippers were routinely flying across the Pacific. Clipper passengers looked down at the sea from large windows and enjoyed the comforts of dressing rooms, a dining salon that could be turned into a lounge and a bridal suite. The Clipper's 74 seats converted into 40 bunks for overnight travelers. Four-star hotels catered gourmet meals served from its galley. One, if not the most famous of the Clippers was named Dixie, NC-18605 which inaugurated trans-Atlantic passenger service, on 29-Jun-1939 from Port Washington, New York, then to Horta, Lisbon, and Marseilles. She was purchased by the U.S. Navy in 1942, but continued to be operated by Pan Am. On January 14, 1943, President Roosevelt was flown to the Casablanca Conference, to meet with Churchill and Stalin during the height of WW II, thus becoming the first in-office president to fly, and the 314 Dixie Clipper the first presidential airplane. President Roosevelt celebrated his birthday in the flying boat's dining room.After the War she was sold to World Airways and later scrapped in 1950. Engines: Four (4) 1,600 hp (1,192 kW) Wright R-2600 Twin Cyclone (1,192 kw), 14 cylinder, air-cooled, radial engines.